That's how bad Obamacare really is, even for the insurance companies: it's better to close up shop than even attempt to serve customers under the government's onerous rules. U.S. businesses, meanwhile, are engaged in a new wave of job offshoring to India, Pakistan and the Philippines, where Obamacare doesn't exist and an entire workers' salary can be less than the cost of health insurance in the U.S. all by itself. The realization has hit everyone who owns or runs a business: Obamacare will bankrupt America's private sector unless businesses take proactive measures to minimize the hiring U.S. workers. This is especially true in low-wage jobs -- such as the food service industry -- where an employee's contribution to a business simply isn't that valuable to begin with. 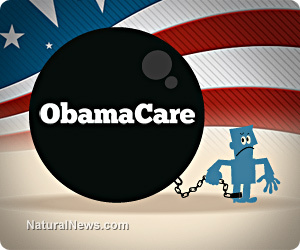 When will the Obamacare train wreck completely derail? All these are yet more signs that Obamacare's socialist-inspired health care utopia is turning out to be a total nightmare. As we've predicted here on Natural News, much of the system will eventually have to be scrapped or sharply scaled back. Why? Because almost no one can afford the scheme. Employers have already begun slashing workforce hours in order to avoid the employer mandates, and individuals who need health insurance are starting to freak out over the reality that their rates are going to double or triple once Obamacare fully kicks in. Remember: This is a law that was advertised as providing either "free" or "affordable" care to everyone, including people with pre-existing conditions. What it actually turned out to be, however, was a monopoly handout to the sick-care industry and the health insurance giants. Instead of promoting health, it kept Americans trapped in a system that profits from chronic disease. Instead of being "affordable," it's making health insurance costs double or triple for many people. There is one benefit to democrats in all this, however: the fact that employers are already firing workers and downsizing operations in anticipation of Obamacare mandates has results in millions of new people subsisting on welfare and food stamps... and that's the ultimate goal of the socialist progressive state. The idea is to destroy the private sector economy and make everyone completely dependent on the government for their food, incomes, housing, education and health care. Only then will the collectivist utopia be fully realized, complete with a domineering spy state, tyrannical police, suffocating tax rates and selective persecution of political enemies by the IRS. Since Obama took office, food stamp rolls have exploded. From 2007 to 2011, the number of Americans on food stamps grew by 70% to 45 million, and as of 2012, food stamp expenditures have reached $75 billion a year. Over four million Americans are now on welfare, and another 5.6 million are living on unemployment insurance. In most U.S. states, welfare pays more than having an $8 / hour job! So as Obamacare kicks in, employers will start tossing people out of their jobs, forcing many of them onto precisely the spiral-of-dependence government programs the Obama administration has been desperately seeking to expand. As the number of Americans who depend on the government expands, so does voter support for whichever party happens to promise the biggest handouts... the democrats, of course. This is how democrats believe you create a perfect society: destroy all private-sector businesses and put the government in charge of everything. This is being done by design, and Obamacare is the lynchpin that will make the hiring of employees all but unaffordable for many businesses. Because once Obamacare really kicks in, all bets are off. All over America, tens of millions of workers will be getting pink slips. While those workers probably voted for Obama in the hope that their employer would be forced to provide them full health care coverage, the sobering reality is that no political mandate can alter the laws of economics. If federal law makes hiring employees prohibitively expensive, employers have little choice but to cut jobs and fire workers. Democrats, of course, tend to think that money appears as if by magic and that businesses can be forced to pay for things they can't afford. But what they fail to recognize is that businesses always have the choice to simply go out of business or radically downsize, firing workers all the way down as they shrink below Obamacare mandate thresholds. Hence the term "49ers" which isn't a sports franchise. It's the nickname given to all the medium-sized businesses across America that are shedding workers to get below the 50-employee threshold where Obamacare mandates put you out of business. If you just happen to be employee number 50, 51 or 52, expect to be fired even though you've done nothing wrong. Thank Obama for forcing your employer to shrink to 49 employees. So all those Americans who suddenly find themselves jobless can thank Obama, Pelosi and all the other nincompoops in Washington for yet more socialist incompetence. What they all fail to realize is that there's no such thing as a free lunch. Not even if it's mandated by the White House. The laws of economics do not bow down to any president. Thanks to Obama's delay of Obamacare until 2015, however, you may get to hold on to your job for another year. But unless you're in a high-level position where your employer can't live without you, be prepared to hit the street in late 2014 as companies start slashing jobs in a desperate bid to meet the "49er" requirement. You'll be joined by a wave of other recently-jobless who were also let go because of Obamacare mandates. Good luck finding employment anywhere, since you'll have loads of competition at precisely the same time no company wants to cross the 50-employee threshold. Thanks, Obama, for causing even more Americans to lose their jobs. It's one more score for the same President that has expanded Gitmo, kept marijuana criminalized, refused to label GMOs and scaled up a massive domestic surveillance infrastructure run by the NSA. Is there anything Obama promised that hasn't ended in complete betrayal?